Odyssey Science Camp, led by the SIUE Science, Technology, Engineering and Mathematics (STEM) Center, will be held from 9 a.m.-3:30 p.m. Monday-Friday, July 15-26 on the SIUE campus. 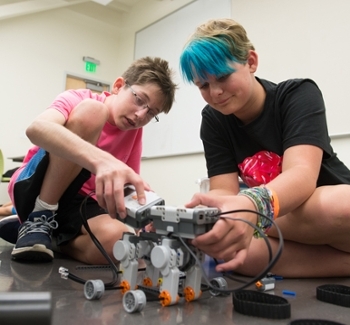 Camp activities range from introducing scientific principles, building math skills, conducting simple “crime science” investigations and using Lego Mindstorm ™, Sphero, Dash and Cubelets to gain experience building and programing robots. Odyssey Science Camp also features two recreational periods that include options of swimming, board games, nature walks and “Talk Nerdy to Me” chats where students will learn the importance of science communication. Registration costs for Odyssey Science Camps are $325, plus a $25 non-refundable application fee. A registration form is available at siue.edu/summer/camps. New this year, early drop-off and late pick-up opportunities are available at the Student Fitness Center. Early drop-off begins at 6:30 a.m. and late pickup will be available until 6 p.m. Pricing details are available at siue.edu/summer/camps. For more information, contact the STEM Center at 618-650-3065. 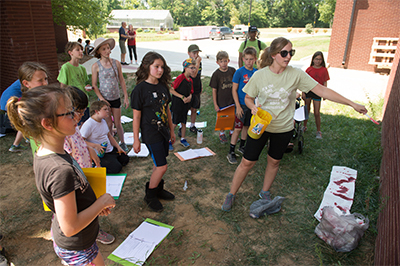 Photos: Super Sleuths at Odyssey Science Camp learn about collecting evidence during an outdoor camp session. Odyssey Science Camp participants work intently to build and program a robot.